Munster and Ireland scrum-half Tomas O'Leary began playing whilst a student at Christian Brothers College (CBC). He quickly progressed to playing schoolboy rugby for Munster. O'Leary was also a promising hurling player, following in the footsteps of his father Seanie, who played for Cork. After graduating from CBC O'Leary decided to pursue a rugby career rather than hurling, and was subsequently part of the Ireland U21 side that reached the final of the U21 World Cup in 2004. Post World Cup, O'Leary was announced as a Munster squad member for the first time, in time for the 2005-06 season. 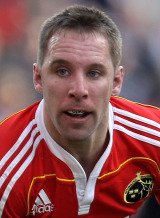 An injury to Ireland scrum-half Peter Stringer allowed O'Leary his chance in the Munster side, making his Heineken Cup debut against Sale in October 2005. O'Leary went on to make seven appearances as Munster won the competition, but was an unused substitute in the final against Biarritz. He was more fortunate in 2008, when he outsed Stringer from the side and marshalled Munster's remarkable victory over Toulouse in the final the the Millennium Stadium. O'Leary made his Ireland debut against Argentina on tour in the summer of 2007, but would have to wait until the 2008 autumn internationals for his second cap, when he was selected at scrum-half against both New Zealand and Argentina at Croke Park. He started four of Ireland's games and featured as a replacement in the other during their march to the 2009 Six Nations Grand Slam and was selected for the 2009 Lions tour of South Africa. He sustained an injury in the Magners League shortly after the announcement and missed out on the tour. In 2010 O'Leary scored his first international try in a dour victory over Italy to kick off Ireland's Six Nations defence.